From an empty head to fennel au gratin! Dead mouse in my shoe, a present from Ben–the kitten. Spotted it just in time–no squelch or scream! Blue sky, bright sunshine–finches feasting on the bird table and window ledges, laden with the sunflower seeds I bought yesterday. A walk before breakfast–feeling virtuous. Catching up on stuff on the computer–checking out the progress of yesterday’s news, e-mail, blog. Well, that’s it then–day done! What’s for lunch?–for instance. Omelette again?–(always the fall back)–really? Sit staring–no idea–no ideas! Not feeling much like doing anything. Lie down for a minute or two–yes, yes. There are those three large fennel bulbs I bought in the market yesterday–just before the sunflower seeds. Fennel salad? with parmesan shavings–could be. Could try that anchovy dressing we had yesterday on the escarole lettuce–delicious. Steam the fennel slices until they are tender. Gently sauté the bacon bits until they color a little. Oil the base of a thick gratin dish–I use a medium La Creuset. Cover with a layer of fennel. Sprinkle with some of the bacon and parmesan and season lightly. Repeat the process until you have used all the fennel. 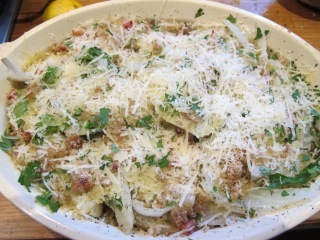 Mix together the remaining cheese and breadcrumbs (grate more parmesan if needed). Cover the top of the gratin with this mixture. Trickle some olive oil round the edge of the dish and back and forth–criss-crossing the top. Put the dish on the top shelf of the oven for twenty minutes–you could check it after fifteen. Take it out of the oven and let it settle for ten minutes. The moral of the tale: don’t panic! 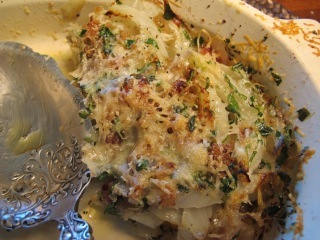 (I notice–after lunch–that I posted a version of Fennel au gratin 3 months ago–but this one is different–with bacon added). Lovely! I can hardly wait to try this! I love the way you write! You have a gift for making words sound just as if you are standing there talking. I just finished your book, Making Poldark. It was FAB! Someday I’ll tell you what my cat, Stanford, brought into the bed. Thanks Patricia–will Stanford’s contribution give me nightmares!? Love your blog, Robin. Thanks for sharing! The fennel and bacon & gratin sounds LOVELY. I’ll try it soon! Meredith usually deals with them and leaves the spiders to me! I love fennel and will definitely try this! Thanks for sharing! We had mouse and cat rodeos as a nightly routine. The mice came in from surrounding fields. Cats are also excellent spider killers. There are some large ones in this area. It’s amazing how these small pests can scare the daylights out of us. On a more pleasant note- I enjoy the recipes. They are all doable. I am looking forward to your fennel gratin. Fennel is not one of my favourite vegs,as I am not a lover of aniseed, but I think I could manage this with the taste from the cheese,and the olive oil. There is never a dull monment in your home,your cats must be an endless source of surprise,joy and laughter,though not quite sure which finding a mouse in your shoe first thing in the morning that comes under.Mice & spiders I can deal with, slugs ow grr they give my the creeps. I was going to say, as it was said above, at least the mouse was dead. I cannot say that that has always been true in our house. I don’t mind spiders, but mice, ugh. My cat, Lily, brought me a dead mouse the other day. I was watching TV and noticed that she was sitting next to the TV staring at me. I ignored her and continued watching TV. Lily continued to sit and stare. I then took a closer look at Lily because when she sits and stares…something is up. There was black fluff lying on the ground a few inches in front of her paws. On further investigation…well you know the rest. I just made a great fennel dish using goat cheese flavored with chiles. Bacon and spinach too. Yummy.. I’ll try yours. Fennel, who knew it is so versatile? Dear Robin,Hmm, Puske Puske did the same a while ago in my shoe.Cats are so loyal and they work and try to help and remove unwanted guests(spiders,mice etc…).Do you have any scorpions overthere because France is well knowed for that.Here in Belgium the weather is cold & damp went several times to the hospital (under the scanner) they found a big tumor in my shoulder 27 x 7 cm.Now I have after efects of the scanner and feeling very tired, more tests coming weeks.Have a nice day dear Robin and give my regards to Meredith and the cats. Sounds like a difficult time Chantal–I’m sorry to hear you have had this diagnosis. Rest, rest, rest. Not seen a scorpion here–as yet! Same recipes–just invite more people?! mussels and scallops–wonderful. Early on a holiday in the Hebrides, I had my walking boots on for the first time. The right boot wasn’t very comfortable, but it was some time before I eventually bothered to take it off and investigate – there was inside a small but chunky little cat biscuit (nothing worse, thank goodness)….! Thanks, Smokey! re. Spiders – I also heard that keeping horse chestnuts about the place can deter them, something to do with a chemical the chestnuts emit? (I quite like spiders actually – British, non-poisonous ones anyway – and give any that reside here some quite exotic names – but prefer not to have them in the bedroom, I must admit). On a culinary note, I enjoyed your Socca/chickpea-flour pancakes for the first time ever, this week – delish, and thank you! I just settled on a cauliflower recipe for tonight from Delicious Dishes that suggests serving over the pancakes! Thanks so much for your transparency… And recipes!! Making this dish was my first time to cook with fennel and to cook up one of the recipes on your blog. I did add a couple handfuls of button mushrooms since I was only able to find two fennel bulbs at the grocery store. My husband gave the dish a nod of approval and I rather liked the combination of flavors. Welcome Susan! Good idea–lightly cooked mushrooms would be lovely. We have had two(outdoors in garage used for storage), both with peanut in mouth. They must have died happy?? We have had nests all over garage, they are tricky little things! Do not want them in my home!!!!! Well, I now know I am a wimp in the kitchen. I made the Celery Au gratin. What a work out and I chickened out an only put 1/2 tsp of cayenne pepper in the dish. I know now I will increase it to 3/4 tsp. The dish was so tasty, fresh, and attractive on the plate. Thank you Robin and Meredith for giving us so many healthful dishes. Amazon today has Poldark advertised. Take good care.